Back when Mattingly was good at his job. Don Mattingly was a great player. Injuries might have limited his place amongst Yankee greats, but this is a player who put up spectacular numbers during his peak years. 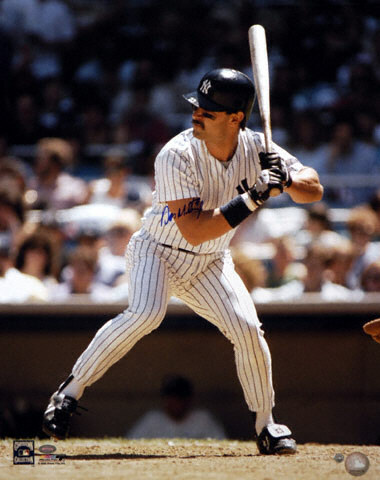 From 1984-1989, Mattingly averaged 27 home runs, 43 doubles and 203 hits. From ’84-’87, his worst OPS was .918, and for his career, he walked 588 times, which is nothing to write home about, but he only struck out 444 times in 7722 plate appearances. Exceptional performance. He’s not a very good manager, though. Here’s a link to an article on espn.com in which Mattingly discusses why he won’t drop Dee Gordon and his abysmal .250 OBP from the leadoff position. How about anybody else?! ANYBODY on the Dodgers would be better than Gordon. This isn’t hyperbole, literally anyone on the Dodgers would be better than Gordon at batting leadoff. OBP is the single most meaningful offensive statistic, and this is especially true for the leadoff hitter who will come to the plate more than any other player on the team. Of the 90 eligible players in the national league who qualify for the batting title, Dee Gordon ranks 86th in OBP. So when Mattingly asks who else can hit in the leadoff spot, I have 85 suggestions and they’re all better than his. Ellis, who normally bats second, began the day with a six-game hitting streak and a .385 on-base percentage — Gordon’s figure is .250 — and Ellis also has enough speed that he wouldn’t clog the bases, which is the concern that stops Mattingly from putting the A.J. Ellis and his .455 OBP into the top spot. Read that again. Mattingly is worried about getting people on base. He is worried about getting people on base. He doesn’t want to bat anyone else in the top spot because he’s concerned they might get on base. He has a player who gets on base 46% of the time, but he won’t let him bat leadoff because he might get on base and that would be bad. This would be funny if it weren’t so sad. Mattingly should be fired today. Anybody who thinks getting baserunners on is somehow a double-edged sword because some players are slower than others should not be involved in professional baseball. The objective aim of an offense should be to never make an out. If this occurs, you will score an unlimited number of runs. Every out means the potential loss of runs. The fewer outs each player individually makes, the more runs they will help produce, and the more runs a team scores, the more games they will win. Now, since it is impossible to not make outs, a team will try to make productive use of their 27 outs per game, and this is done in endless ways which need not be discussed at length here, but quickly, this is why slugging percentage is important, because it’s obviously better for a batter to get an extra-base hit than a single, though the attempt at a higher slugging percentage sometimes means more outs will be created than a hitter who is only trying for a single. Let’s just keep it simple in case Mattingly reads this – outs are bad and getting on base is really, really, really good. And when you think about it this way, the Dodgers situation gets so much worse when you consider how Mattingly employs Gordon’s speed. Gordon has stolen 12 bases, which is good, but he’s been caught 5 times, which is not particularly good. It’s not that terrible by itself, though stolen bases are really only valuable if the success rate is 80% or higher, but when you realize that Gordon has only reached base safely a pathetic 35 times the entire season and that he has negated that mark by getting thrown out stealing 5 times, he’s really only been on base for the rest of the lineup to drive him in 22% of the time. And I rounded up to get to 22%. If the objective of an offense is to not make an out, and the leadoff hitter will come to bat more than any other hitter in the lineup over the course of the season, then is it really that difficult to know that a man who fails in this task a whopping 78% of the time is hurting the team? By the way, I like Gordon. He seems to play a pretty great defensive shortstop, and it’s not his fault his manager is an idiot, but for the love of all that is baseball, please get this kid into the number eight slot in the batting order before it’s too late. Oh, and the Dodgers beat Colorado and Jamie Moyer, who did not pitch particularly well. It was fun to see the ex-Cub, even if it wasn’t his best day. This entry was posted in Baseball, Los Angeles Dodgers and tagged Baseball, Los Angeles Dodgers. Bookmark the permalink.